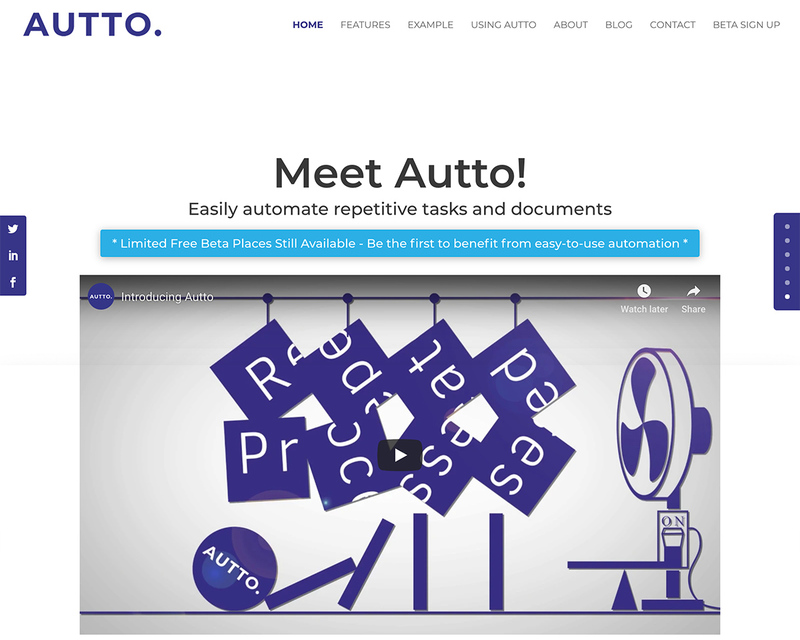 Autto is an easy-to-use platform that allows you to turn you repetitive processes into automated workflows that run anywhere. With Autto's accessible automation you increase productivity, eliminate mistakes, and make jobs more fulfilling. Use Autto to automate legal documents, approvals, standard emails and a wide range of business processes. Build a workflow online by linking actions, including automated documents, emails, pages, forms, Get API data, in a visual editor, then publish and run securely from any web browser. Now in Beta with companies from startups to interational law firms. We're looking for more companies to join the free beta. Visit autto.io, sign up to help shape the future of work and be the first to benefit from efficient automation.